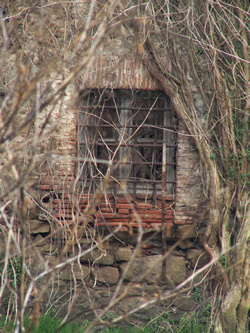 In 1984, Giancarlo Venturini “retired” from the fashion field and devoted the next ten years to the buying and the restoration of rustic properties from the Tuscan countryside. This quest gave Giancarlo a sincere appreciation for the original materials used in construction dating back anywhere from 100-300 years or more. Giancarlo recognizes the worth of these materials, as they continue to hold the underlying beauty and endurance through time and the elements. As with his collage of workman tools, Giancarlo feels strongly that these objects still have much to offer and has given them a new expression. The all-important finishing touch for an Italian Art Original is the custom Italian Chestnut Wood frame, each an individual creation; with age comes a beautiful grain. Reclaimed during restoration of 17th and 18th century farmhouses and Villas, the wood is primarily from discarded window frames and shutters. Chestnut Wood was common for construction of the time. 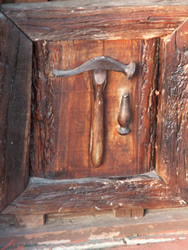 Many retain the original hardware of hinges, latches, square nails and various adjusting apparatus. Occasionally, the slates from an antique wine barrel or a spoke from a 200 year old Sicilian wagon wheel will be beautifully incorporated into the frame. All pieces are individually hand-worked and permanently attached in a blend of art and craftsmanship. "Art consists of limitation . . . . Has not everyone noticed how sweet and startling any landscape looks when seen through an arch? This strong, square shape, this shutting off of everything else, is not only an assistance to beauty; it is the essential of beauty. The most beautiful part of every picture is the frame." G. K. Chesterton (1874-1936), English journalist and writer, Tremendous Trifles, "The Troy Theatre," 1909.